Barneys Farm 8-­Ball Kush is a mostly indica marijuana cross from the Barney’s Farm’s regular seed collection. 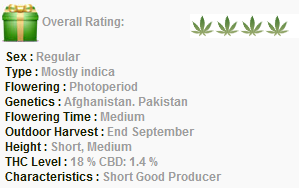 The origin of this strain goes to the Afghan and Pakistan mountains. Over years, Barney’s Farm’s seed breeders tried to combine the best qualities from the both parents in order to create an easy growing cannabis with heavy bud production. 8 Ball Kush is definitely a success of many years of selective inbreeding. 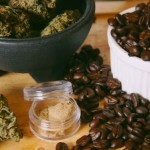 Cannabis Seeds of this marijuana variety are extremely easy to grow. They are very resistant to mould and mushroom and cope fine with stress. They show a good 90% germination rate and produce healthy seedlings which can be put under a 12/12 light cycle straight away. 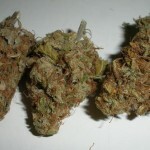 Seeds of 8 Ball Kush are suitable for indoor and outdoor growing. When grown indoors, plants of this cannabis show great results in all sorts of setups, pots, soils and hydroponics. Matured plants are typically indica – they are really petite, just 60 cm, with a well developed x-mas tree shape. It’s very easy to manage and manicure these plants – they don’t seem to need any special care. Flowering takes just 55 days, a mild spicy/hash aroma appear already at the beginning. It become more intense while maturing, yet, will not smoke you out of your home. Outside harvest starts at the end of September. 8 Ball Kush cannabis is a great yielder. 450 gr. per m2 is amazingly high for such a small plant and is guaranteed even under unfavourable conditions. Bud form compact sticky groups between, they are very dense and contain at least 18% of THC and 1.4 % of CBD. This balance makes her high very powerful, corporal effect. What do you think about Barneys Farm 8 Ball Kush? Leave a comment below!